Welcome to the eighth post of the series. In the first four blogs, we saw how Articulate Storyline 360 enables you to develop e-learning courses easily. We also looked at the Articulate tool’s abilities to create animations and facilitate e-learning interactions. We examined the features of Storyline 360 that help develop effective software training simulations and online learning assessments. We also looked at Storyline 360’s features that facilitate responsive and accessible online learning. In the fifth, sixth, and seventh blogs, we looked at the features of Presenter 360 , Quizmaker 360, and Engage 360, components of Studio 360. Today, we will examine another key element of Articulate 360, Peek, and examine its features. Peek is an application that can be used to create screencasts of software applications. The screencasts, created using this Articulate application, can be used to develop video and simulation-based lessons to train your employees on software applications. Peek is compatible with and can be used on computers that run Macintosh or Windows. 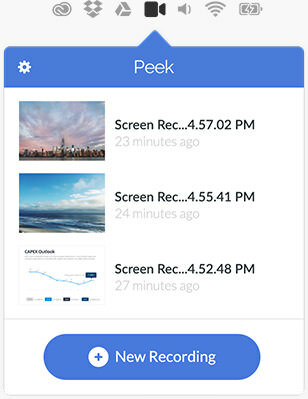 You can create screencasts effortlessly using Peek. The Articulate 360 tool is displayed on the Mac menu bar or the system tray of your Windows PC. All you need to do is click it, and the power of this application is unleashed. Many a time, developers of online software training resources need to customize screencasts, and this can take time. You can overcome this problem easily, using Peek. You just need to drag the frames of the screencast, created using this Articulate tool, to create a customized view. It is as simple as that. You can ensure that the audio of your video-based software training lesson is clear and consistent, using Peek. The Articulate 360 component allows you to test the volume of the audio to make sure it is of good quality. Peek enables you to share your screencast, by hosting it on your Learning Management System (LMS). The tool also allows you to upload the screencast onto Articulate 360 and share it through a unique link. It is a well-known fact that we live in a multi-device world. Most of us use various devices to access online content, and web-based learning resources are no exception. You can use Peek to enable your learners to access screencasts on the device of their choice. This is possible as the output of the tool can be added to responsive e-learning courses, created using Rise, another Articulate 360 component. We thus see that Peek can be used to create good screencasts that go a long way in the development of effective online software training lessons. In my next post, we will examine the features of Rise, the Articulate 360 tool used to develop device-agnostic e-learning courses. So, stay tuned.